It became apparent at a recent training match that my nine year old Border Collie’s cataracts have grown to the extent that he can no longer compete in the obedience ring. 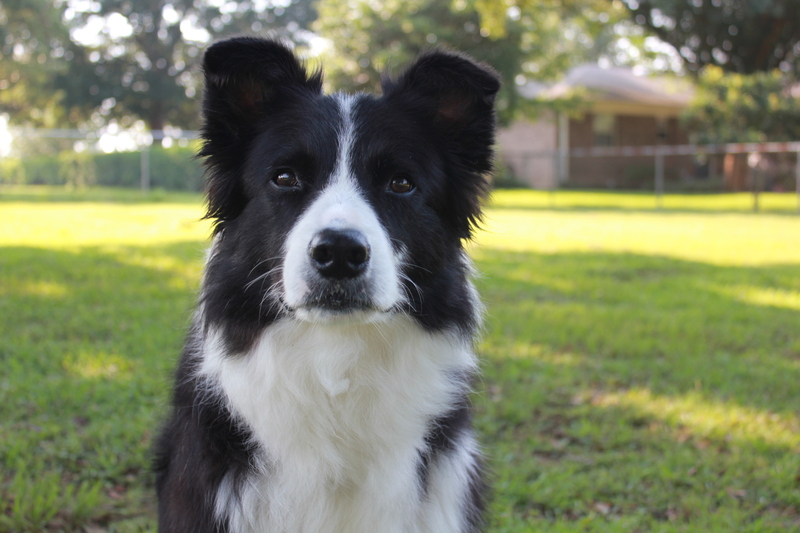 It became apparent at a recent training match that my nine year old Border Collie’s cataracts have grown to the extent that he can no longer compete in the obedience ring. Although we can never know exactly how much he can or cannot see, it is pretty obvious that his sight isn’t one-hundred percent. His eyes were tested last September at an eye clinic while he was competing at a Biloxi, Mississippi show. The doctor at the time said Levi’s cataracts were bad but that Levi could probably see well enough to show. But the last time Levi qualified in the obedience ring was last year, although that’s only a handful of shows between then and now. Levi has also bumped his nose into the walls at home a few times. We both seemed embarrassed. He’d wince, I’d cringe and we’d move on. We had a great time showing over the last eight years. Levi has been the smartest, flashiest dog I’ve ever trained. Unfortunately he taught me all the hundreds of ways a dog can interpret or misinterpret an exercise. This will be invaluable experience when training my next dogs. It was not so much fun at the time, when I was screaming inwardly in frustration. He has always had an anticipation problem, worse than any Golden Retriever I’ve trained. But, just like my Goldens, Levi has a good sense of humor, tail wagging and eyes sparkling, proud that he had read my mind before I spoke. Many judges and competitors have commented on Levi’s work ethic in the obedience ring. When he flunked he did so with pizzaz. When he passed I’d sigh with relief that he had held himself together. If I wanted a dog to put me on the front page of the newspaper, this was not the one to do it for me. If I wanted to learn how to train a high energy dog with control issues, this was the one. After every show I’d wonder if I was a poor trainer or was this dog nuts? My puppy, Catcher, is more mellow and down to earth. He waits for commands, eyes bright with anticipation but holding a stay. I hope he doesn’t become boring to train after Levi! Now Levi can sit in his crate ringside at shows while Catcher debuts in the ring, although I expect I’ll hear Levi’s soft crate ripping. Levi doesn’t like to play second fiddle to his roommate. I may need to play dog show with Levi in the show’s back forty when Catcher is relaxing in his crate. I could board Levi while showing Catcher but that is almost cruel. Levi gave me so much of himself for eight years. He deserves long rides, motel rooms and new places to sniff. Levi’s veterinarian said his recent blood work was as good as that of a two-year old dog. I expect even if Levi can see the world through foggy lenses, he still can enjoy the smells around him. He knows the sounds and smells of a dog show. He loves his walk at the local Equestrian Center, where he can scope out his favorite hor d’oeuvres, Road Apples. Yummy! What he doesn’t know is that I may audit a herding seminar this fall. Border Collie nirvana, the smell of sheep. Life can be grand, even for an old dog. I am Levi’s third home; his last home. I have never felt sorry for him because Levi doesn’t feel sorry for himself. To him, every morning starts a new adventure. He lives in a big house on acreage, with a cozy sofa he can snooze on, a cat to tease, a young Border Collie to run with and an air-conditioned car to ride in. Life is not complicated for him, except maybe when the dreaded thunderstorms come through. Then he needs me to let him know that his world is not ending. Levi, we all need reassurance now and then. I am here for you, Bud. Let’s spend our senior years together. This entry was posted in Dog training and tagged Border Collie. Bookmark the permalink.